Goo.gl is a service from Google that let’s you shorten URLs, track them and create QR codes. 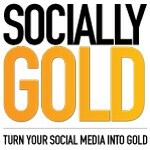 In this post, I’ll show you how to use the service and give you ideas of what you can use it for. You may be familiar with shortened URLs from their popularity on Twitter and Facebook. I’ll cover some myths and appropriate uses as well. Step 1: Navigate to goo.gl. You don’t need a gmail account to use it, but if you want to access your stats forever, I recommend creating a gmail account if you don’t have one. After you have logged in, type in the URL and hit the Shorten URL button. Step 2: After hitting the Shorten URL button, you’ll see your shortened link below as well as a preview of the website your link is pointing to. Once the shortened link is generated, hit ctrl+c (Windows) or cmd+c (Mac) to copy the URL. 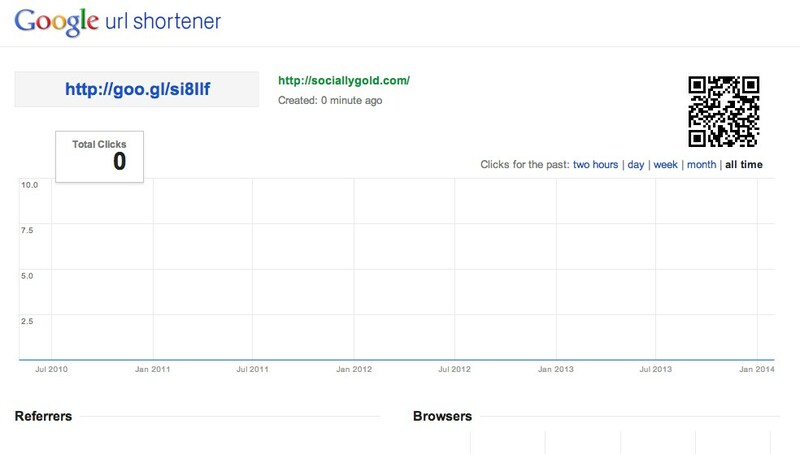 You can navigate back to this page in the future to see how many clicks your link received. More on why to use this below. Step 3: To get your QR (Quick Response) code, click on Details. I wouldn’t recommend using a QR code to simply go to a website. It’s ideal to incentivize scans with a special offer. 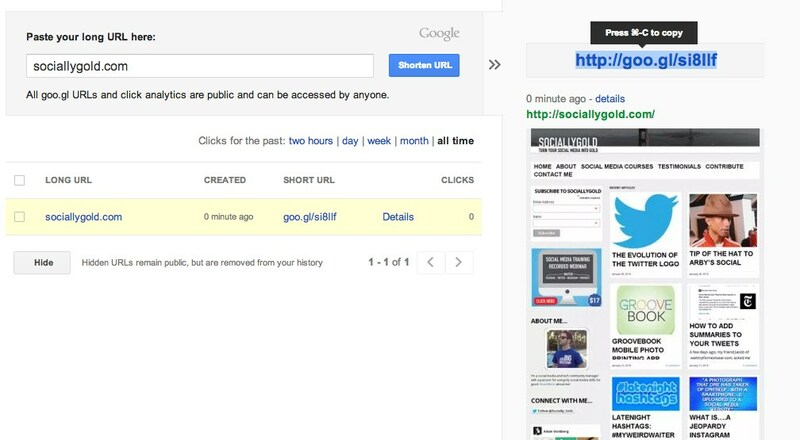 This screen also gives you enhanced details about the clicks of your shortened URL. The QR code is on the right, which will add to the click count when scanned. Now you have your shortened, trackable URL and QR Code. See below for myths about the shortened URL and strategies on how to use it. Shortened URLs take up less characters in Twitter. Not True. Whether I use the shortened URL or not, this tweet takes up 42 characters. No matter the length of the URL, the tweet still utilized the same number of characters. Some users may be wary of clicking on your shortened link because they don’t know where they are clicking. Get your fans used to you using shortened URLs as to not deter them from clicking. Unless you are using them for tracking, you may want to consider using the full URL. The non-shortened URL in the 3rd tweet above is long and doesn’t look very pretty. Some will use a shortened URL so they don’t have to post, what they consider, to be an ugly URL, especially on flyers and promotional materials. 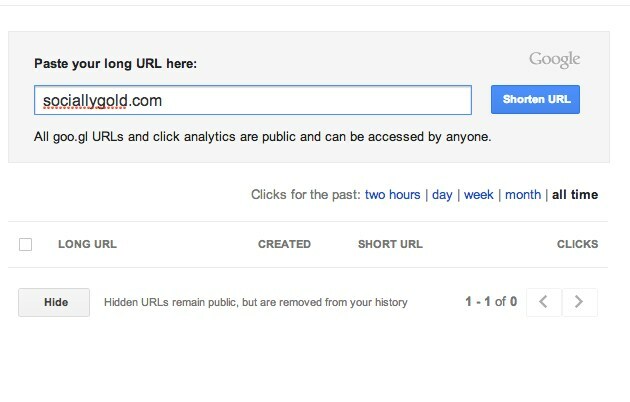 If you are using shortened URLs for tracking and not for hiding ugly URLs, you don’t need to. Facebook Insights tracks URLs for you. 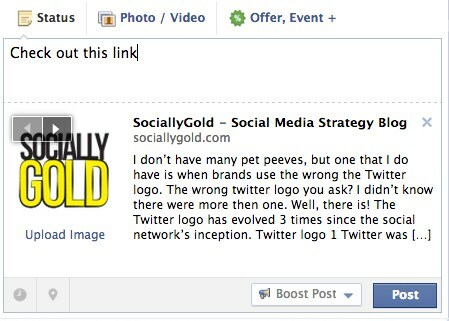 There is a feature of Facebook that most users don’t know in regards to posting URLs. This will be helpful if you want to use the shortened URL. 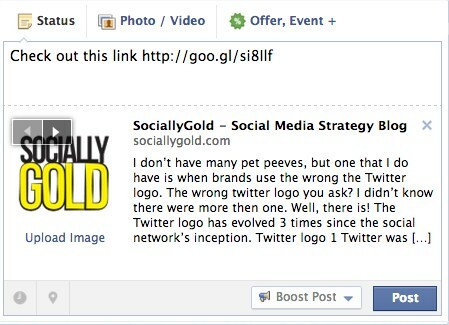 When you post a link, Facebook will generate a thumbnail for you. Notice the shortened URL. The feature that most users don’t know, is that you can delete the URL, shortened or not, and the thumbnail will still stay.
. In personal emails. You can hyperlink them and no one will know you are tracking it. Most email programs like Constant Contact, AWeber and MailChimp tracks clicks for you. So there you have it. A way to shorten URLs, create QR codes, track those URLs and a few uses. If you learned something from this post, please share it with friends.